PM2.5 Detector Digital Air Quality Meter Gas Temperature Humidity Analyzer Diagnostic Monitor Health Care Tool by Yosooo at Humble Opinion. MPN: Yosoorzfpvkx7o3. Hurry! Limited time offer. Offer valid only while supplies last. Description: This is a real-time PM2.5 air quality monitor instrument used to monitor the concentration of PM2.5 in the indoor/outdoor environment. This is a real-time PM2.5 air quality monitor instrument used to monitor the concentration of PM2.5 in the indoor/outdoor environment. It features clear LED display screen to indicate PM2.5 pollution level. Very good and helpful for environmental protection. Suitable for home, office, outdoor, car and other places use. The super mini pocket design that can carry around and detect anywhere you like. An ideal multi-function testing tool to monitor the air quality, a safeguard for family health. 《DIGITAL LED DISPLAY》Digital LED display shows the testing results, easy and clear to read. 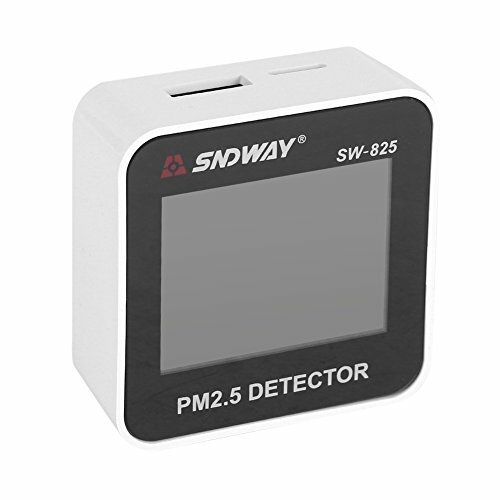 《ACCURATE TO DETECT》Accurate to detect PM2.5 in air with detection sensor technology in real time. 《MULTI-FUNCTION》Suitable to use at home, office, in the car ,outdoor and other environmental testing. An ideal multi-function testing tool to monitor the air quality, a safeguard for family health. 《ALARM FUNCTION》When the detected result over the setting value, the result will blink in red to alarm.